Grace Point is conveniently located south of 30A. It is nestled between Prominence and WaterSound Beach. It is a great place to escape reality and enjoy a private and relaxed setting. However, when residents crave some entertainment, there are numerous shopping and dining opportunities nearby. The community broke ground in 2015 and offers 43 homesites within a close proximity to the Gulf waters. It is easy to move between the neighborhoods while using golf carts. For added access to the beach, a community trolley is being planned so that homeowners can easily go back and forth during the summer season. Also, a possible concierge app is in the works to arrange beach transportation on the trolley as well. 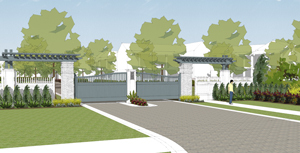 This planned non-rental community is gated and will contain a large pool, which is slated to be finished by Fall 2016. This pool space will have an expansive deck with breathtaking views of the Gulf. This will provide the perfect area to lay out in the sun or grill with friends and family. The architecture at Grace Point is set to mimic the classic look of similar coastal communities in Nantucket, Cape Cod, and Martha's Vineyard with an American Shingle Style. Although diverse in evolution and complex in design, the community will present a simpler atmosphere to mask the laid back life of the region that resonates with individuals who want a place to unwind and relax. Grace Point has architectural roots in the past, but it offers unique, elegant, and sophisticated touches that appeal to residents with modern and high-end tastes. It creates memories that will span generations. House plans are available, or a buyer can use a personal contractor to create a home of a lifetime. After being approved by the Architecture Review Board, ground can be broken immediately. To keep things uniform, all structures must have three stories and adhere to architectural guidelines. Enjoy the natural light as it enters the windows and dormers and bask in the serenity of the area while sitting on the porch. Time stands still among the swaying palm trees. Now is the occasion to claim a lot within Grace Point, a community filled with charm and tranquility. click below to see examples of homes & homesites.